He reached into the cabinet behind his desk and pulled out the object that best demonstrated his point: a tissue box. Andrew Carter never knows what his rowing team will need from him, be it a coach who can talk his rowers through their next race or a father figure who’s standing by to help them through a rough patch in a relationship. The tissues often come in handy. Since arriving on campus in 2010, Carter has embraced many roles at once. He employs the values he learned from his family to make sure his team acts by the same high standards. 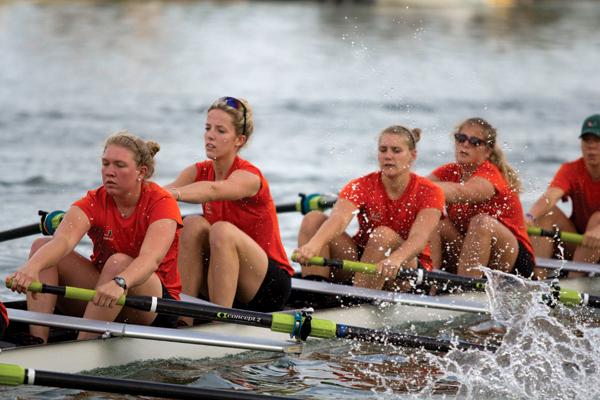 The University of Miami’s head rowing coach is a meticulous leader whose vision for the program has it destined for success. He takes great pride in the team’s attitude and outlook, and has worked to transform those qualities during his tenure. He came here from Clemson, a school that he felt was not headed in the direction of competitive success. Before that, he directed the men’s and women’s rowing programs at Bates College in Maine. And even though his team operates on a strict training and practice schedule, he hesitates to define a typical day on the job; instead, Carter references a piece that he wrote in 2006, when he was at Bates. So begins a day that often carries on for 16 hours or more. Every minute is occupied, because to Carter, no minute can be wasted. Carter is Canadian, as is his wife, Kim, but he has spent the majority of his coaching career in the United States. He did spend two years coaching at the National Rowing Center in Ontario. Carter also took a one-year sabbatical from Bates to coach in New Zealand, where he seriously considered staying permanently. Hints to his heritage peek through in different ways, from the Canadian flag pennant that hangs behind his desk, to the subtle accent that permeates his speech. Siemann is one of just two seniors on the roster of more than 35 rowers. The overwhelming number of freshmen and sophomores on the team reinforces why Carter’s leadership responsibilities extend beyond those of a typical coach. It’s fitting that Carter approaches his job with equal emphasis on coaching, teaching and parenting. He has a 9-year-old son, Mason, and the lessons Carter has learned from raising him have translated directly to the team. Mason, whom Carter described as “sports-crazy,” meets all of the Miami recruits. He attends meetings regularly. And he has a stack of handwritten business cards on his dad’s desk that read: Mason Carter, Assistant Rowing Coach. “He’s never thrown a tantrum in his life, but when he found out he wasn’t on the payroll, he absolutely lost it,” Carter said. In a remarkably organized office that is decorated by little more than two large trophies and a seat from an antique racing boat, Carter keeps two frames on his desk. One is a photo of him with Mason on the beach. The other is a note scribbled by what could only be a child’s hand. Top 3 ACC. Win ACC. National Champions. These days, as the spring season winds down and the Hurricanes have grown stronger, faster and more competitive with their conference rivals, Carter knows those goals will be within reach soon enough. His confidence stems from his most fervent strategies, which are simple enough for even Mason to grasp. Carter relies on routine, focus and clarity. So pedantic is Carter that he has studied his sleep cycles to learn how to wake up without an alarm clock. Two minutes before it would typically ring, he is awake. Every day. Widely regarded as an expert in the technical and mechanical aspects of rowing, Carter’s knowledge has afforded him the opportunity to add an interesting title to his already full plate: consultant. Equipment companies looking to refine their latest products, authors seeking clarification for the information in their rowing books and articles – yes, he confirms, people do write books about rowing – and major rowing conferences that search for the best in the business to hire as their speakers all turn to Carter for his skill. But at the end of each day, when Andrew Carter has returned to bed with enough time to squeeze in four or five 90-minutes sleep cycles, it’s Miami on his mind. For that, they have a coach, a teacher, and a self-proclaimed surrogate dad to thank.